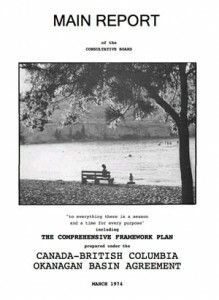 The Canada-British Columbia Consultative Board has completed a four year study of water resource management in the Okanagan Basin with the objective of preparing a comprehensive framework plan for the development and management of water resources for the social and economic betterment of the Okanagan community to the year 2020. The Okanagan Basin Study represents a new approach to water management, bringing together the combined skills of many experts in the fields of water quantity, water quality, waste treatment, socioeconomics, limnology and fisheries. Information on health, wildlife, forestry and land use was also included in the development of the plan. 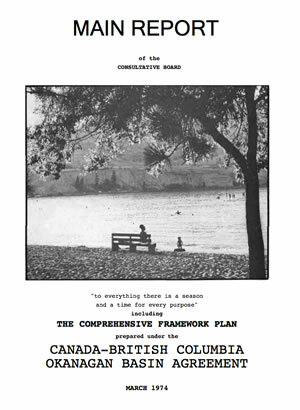 As the plan was specifically designed to provide for the social betterment of the valley residents, a sincere attempt was made by the study both to educate the public about water management problems in the Okanagan and to receive and consider ideas from citizens regarding their preferred future lifestyle.